Harrison Barnes is the second ranked wing on our board, and looks similarly underwhelming when just looking at overall scoring efficiency. Barnes' 0.941 PPP ranks just behind Michael Kidd-Gilchrist, good for 13th of 18 overall. He is doing it on a much higher number of possessions, however, as his 17.5 possessions per game ranks fourth highest in the group. Barnes ranks pretty average in scoring efficiency in almost all areas, unfortunately, most notably standing out for his very poor finishing around the basket, as his 1.049 PPS there ranks second to last overall. On the other hand, his 14.0% free throw rate ranks fifth highest of all players, so he makes up for his poor finishing somewhat by getting to the line so frequently. It will be interesting to see if Barnes' game benefits from the better spaced, more isolation-oriented NBA, where he could see more room and less attention to create his own shot and get open, which could be a boost for his efficiency in some areas. Mike Schmitz takes a look at the strengths and weaknesses of Harrison Barnes with the help of North Carolina game film, Head Coach Roy Williams, Duke assistant Chris Collins, and commentary from Barnes himself. 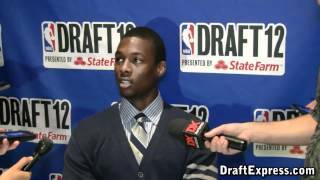 Harrison Barnes bypassed the 2011 NBA Draft, and the opportunity to be a likely top five pick, to return to North Carolina for his sophomore season, giving the Tar Heels a roster loaded with NBA talent, and the consensus preseason number one ranking in most NCAA polls. Barnes ended up leading his team in scoring as a sophomore and earning First Team All-ACC honors, but his season finished on a low note, shooting an atrocious 20 for 61 (33%) in the NCAA tournament, and leaving NBA scouts with a poor final impression as North Carolina lost to Kansas in the Elite Eight. This marked the end of a highly scrutinized two-year college career for Barnes, who never quite lived up to the huge expectations bestowed upon him as the top overall recruit in the nation coming out of high school in 2010. While Barnes' disappointing finish to the season highlighted some of the concerns NBA teams may have regarding how his game will translate to the NBA level, he's still likely to be a very high pick in this summer's NBA Draft, as he brings a quite a bit to the table, starting with his ideal physical profile for an NBA small forward prospect. He has great size at 6-8 to go along with a long wingspan, and a very strong, mature frame for a 19 year old (he'll turn 20 next month). He doesn't possess elite explosiveness, but he's very smooth and fluid athletically, and should have an easier time than most rookies adjusting to the NBA from a physical standpoint. As we discussed last year, Barnes' biggest strengths revolve around his excellent scoring instincts and offensive polish, effectively utilizing shot-fakes and displaying advanced footwork when catching the ball on the perimeter and in the mid-range area, which he uses along with his great size and frame, to create space to free himself for jumpers. His 23.3 points per forty minutes ranked him amongst the top per-minute scorers of all wing prospects in this draft class, but he still struggled to score efficiently as a sophomore, showing many of the same issues that we highlighted last season. His lack of an explosive first step prevented him from getting to the rim and creating easy baskets, and while he did get to the free throw line at a higher rate this season, he still seemed far too content settling for contested jumpers off the dribble, as he connected on an unimpressive 47% of his field goals inside the arc. From 3-point range, Barnes shot a respectable 36% and shouldn't have much trouble adapting to the NBA line, but he's not yet a prolific deep shooter. He has a tendency to be a bit streaky and miss shots badly on occasion, some of which he should be able to improve on with repetition and better shot selection. Another area where Barnes hasn't shown much growth is with his ability as a passer and creator for others. His comfort level as a ball-handler looks to decrease dramatically after a few dribbles, and he doesn't have the creativity or vision to find his teammates for easy baskets, as evidenced by his extremely paltry assist numbers (his 1.5 assists per-40 ranks him towards the bottom of all small forward prospects in our Top100), particularly for a player who has the ball in his hands as much as he does with the freedom to make plays. On the defensive end, Barnes still shows the same promise that we noted last year, thanks to his solid physical tools and fundamentals. His size, length, and strength should serve him well defending small forwards at the NBA level, and he does a nice job moving laterally, understanding positioning, and challenging shots. When looking forward to Barnes' role at the NBA level, his mature frame, scoring tools, and defensive ability give him a nice base to build on and should allow to him to contribute to an NBA team right away. His inability to make plays for others, get to the rim consistently, and score efficiently likely limits his upside when compared to the high expectations he had coming out of high school when he was thought of as a potential overall number one overall pick, but he still has plenty of time to shore up his weaknesses and has considerable upside to grow into as he develops his feel for the game. Barnes is an outstanding shot-maker, and should benefit from the greater spacing he'll see in the NBA, giving him more room to operate and create space for himself off the dribble. He should end up being a versatile scoring option who can catch the ball in different areas of the floor, whether it's posting up smaller players, catching the ball in the mid-range, running off screens, or being used in isolations and pick-and-rolls on the perimeter as he improves his ball-handling. If he's forced to be a go-to option too early in his career, Barnes may struggle to adjust, but if he lands on a team playing for a coach who understands his strengths and limitations, and with a point guard who can get him the ball in the right spots, he has a chance for early success. By all accounts, Barnes is a high character individual with a strong work ethic who plays the game with a very competitive mentality, all of which should bode well for him in the pre-draft process. While his poor play in the tournament wasn't the ideal final impression to leave on NBA scouts, he'll have plenty of time over the next couple months to win back fans amongst NBA decision-makers as he conducts interviews and workouts, giving himself a chance to hear his name called somewhere in the top ten and possibly the top five on draft night. Can Harrison Barnes' inconsistency this season be forgotten with a great NCAA tournament?